The jeans look great and so does this outfit. Have a great weekend! Veronica, I really like your looks and this is casual and elegant at the same time (not to mention the fact that I your shoes perfectly match the shade of the tree’s leaves!). Not sure if I’m a fan of lycra or other materials mixed to jeans cotton because, even if it’s used by the best brands and that at the beginning it guarantees the perfect fit, after some times (and washes) it losens the original design/shape. This is the reason why I personally prefer 100% cotton. De gustibus! Another awesome look! :) love it! you look so elegant:) great! lovwe everything you wear!! !but adore your glasses!!!amazing!!! Good jeans are so hard to find. Everything about this outfit is classic and perfect. ur such a classy women :) the leather coat is gorgeous! Those navy sunnies are seriously gorgeous! Styled perfectly with this combo…the colors are perfect! The ensemble, the background, everything’s right on point! Beautiful! You look gorgeous!Love these pictures! I really like how you put together the whole outfit, everything just works. bonus points for the polka dot dress shirt! I simply LOVE red shoes and yours are beautiful!! I would like to see your wardrobe. That is a beautiful jacket, it looks really good on you! Those are really nice jeans as well, looks very clean and classic. Love the red shoes!! I love your outfit. Kisses. thank you very much ladies ! AMAZING, love those photos, especially that jacket and shoes. You look so classy! Gorgeous! all i can say is- pretty pretty pretty! love you blog by the way!! WOW!outfit’ul acesta e minunat,preferatul meu!! Stunning outfit! Love your jacket and your shoes. WOW! You look stunning! LOVE IT. This outfit is impeccable. You look stunning. Love those red shoes!!! Swoon. like so much your outfit! I like your blue sunglasses and dotted shirt! Absolutely gorgeous, Love the whole outfit! Pls, check out our blog for a chance to win an African print collar-bib necklace. i love the blouse and the coat with the belt around it! whoa! you pull this off so well! Everything works for me, but the best part is your smile! Great pictures! Lovely outfit. You look fabulous with your outfit. We love the look. Pretty! veronica, you look absolutely stunning! so elegant and stylish. Love the trench and the polka dots and the shoes!! So cute and chic! You look like an actress! amazing look!I love this style. I loooove your outfit! The leather coat, the shirt… and the bag. Liz Claiborne wouldn’t have guessed. You impressed… matching the color of your shoes with the flowers on the tree!!!! Thank you for your lovely comment! I hope to see you again soon !!! Have a wonderful day! oh GOD! you look so great! i love every part of your outfits.. and that denim are really cool! you have a great taste..
he! so pretty, I love dots and blur&camel. Fantastic outfit is so cute.. Your shirt is beautiful, I like your sunglasses..
And yous shoes is very good.. I think this is my fave from you,amazing!Coat,pants,blouse,everything!Bravo,hun! You look so chic and glamorous!!! what a lovely coat, and the story behind is great. im eyeing on your sunnies, so unique. have to check out Nine West! Love! The shoes and the shirt are simply amazing! This is an impeccable look. You look very stylish. Love your coat, great color. Oooh, what a delovely blog! You look so stylish and I’m in love with you outfit. Such a great post! Really nice outfit :) would you like to follow each other? Great post, I really like your blog. I love your look so much. That is something that we all can wear and more important, that I could wear to school and later to work. Muy bonitas las fotos y el look ideal. La chaqueta y la blusa me han encantado!! Reaaly great outfit :) Have a great week-end ! What a gorgeous, chic, perfectly put together look. I love everything about it and those jeans are a perfect fit! Really really like this outfit!! The colors are so well combined, it’s gorgeous!! This is amazing!! Following you! Love that leather trench and i am always a sucker for polka dots. I love all your outfit, the blouse anda the leather trench are totally mine. Wow!here everything is perfect mixed! 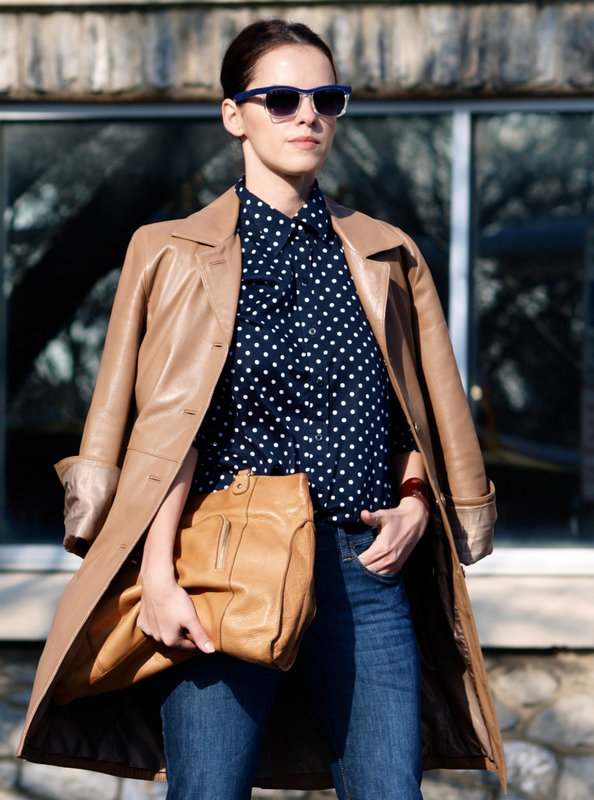 navy dots,burgundy accents and leather coat together looks just gorgeous! amazing outfit and beautiful red tree! !so poetic! Great look! Very classy and chic! Great style. Love the color of the shoes. belt on the coat , great idea..
oh my goodness. chic to the max! I love the color palette and polka dots!! you always look amazing. love love love this outfit! esp. the leather trench! Such a beautiful look! Love the combination of fall colors of the outfit and that the background colors are in an absolute harmony with the pallet of the look! The bag and cranberry pumps are absolutely gorgeous! hahaha! I was right my sweet Veronica( I saw the initials on the envelope DL1961 and went to find it on the Internet!!!! Thank you Vanda ! you are wonderful and always a pleasure ti read your comments! hugs my dear ! Love the polka dots and color shoes! Your hair looks really cute pulled back like this too! such a classic look. I love the pop of burgundy to the outfit! the colors are definitely perfect for fall! 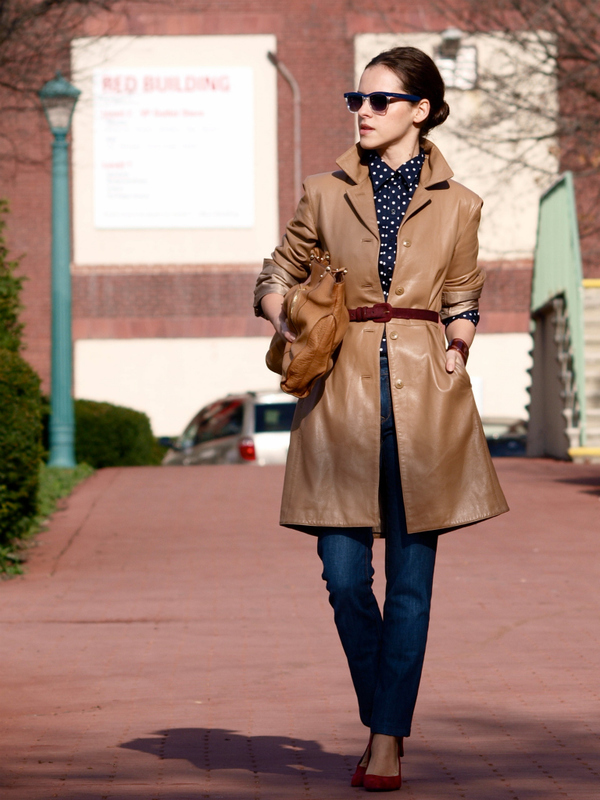 love this outfit!especially your trench! great gift and perfect outfit! little bit of red/burgundy, dots, denim and coat! love it!